Howdy! 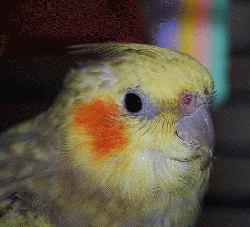 My name is Iris, as in Iris Dement the folk singer, and I`m a female pearl cockatiel. I hail from Santa Cruz, where I was in a cage with lots of other cockatiels who picked on me because they considered me a wallflower. After my former humans were going to set me and my other cage-mates free, Mickaboo stepped in and convinced them to surrender us to a shelter in Santa Cruz. And then...my lucky day came! A nice Mickaboo volunteer offered me a spot in her big bird room where I have my own cage, toys, and some time to grow back my beautiful tail feathers. I LOVE my greens (broccoli and dandelion are my favorite, organic of course), I`m still learning to like toys, and I`m even learning how to step up. Every day my foster mom takes me into the shower for lessons and a lovely warm bath. It`s just a matter of time before I`ll be really social and a great companion parrot for someone. Care to join in on a song with me? Love, Iris.